Pressure cook the washed broccoli florets for 2 whistles. Cut the Avocado into halves and scoop out the flesh and add it to a blender along with the ginger, pepper powder, salt and cooked broccoli. Grind the mixture with Milk. Add more milk or water according to your taste to adjust the consistency of the soup. Pour the ground mixture into a pan and heat it on low flame for a few minutes. 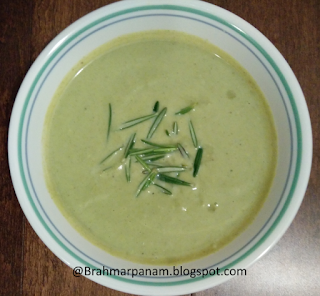 Garnish the soup with rosemary leaves and serve warm.